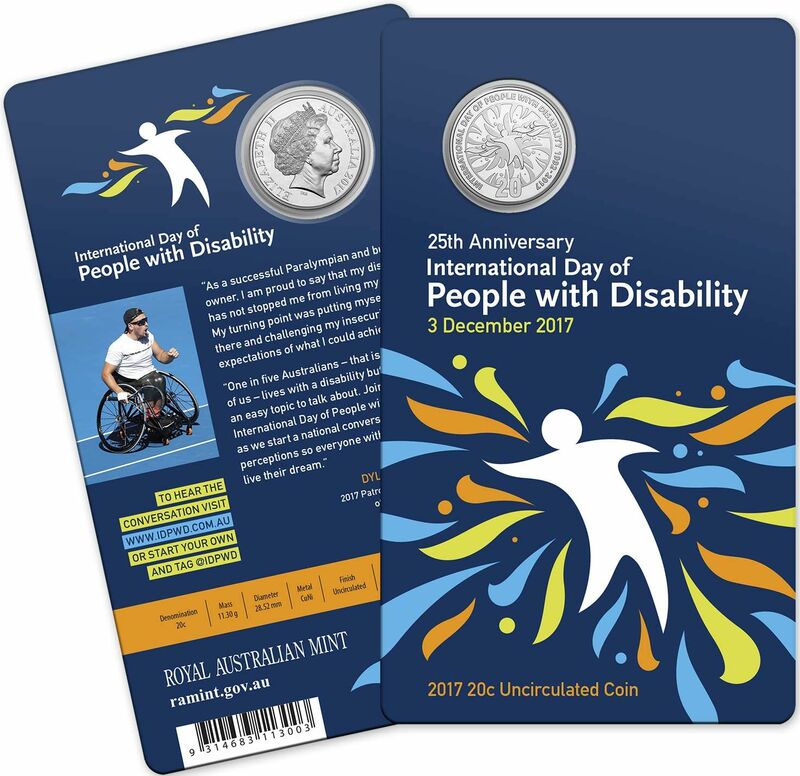 To mark the 25th anniversary of International Day of People with Disability on December 3rd 2017 the Royal Australian Mint (RAM) released this specially designed commemorative 20 cent coin for the collector market (NCLT-not for circulation). Issued on a collector card and in an Australia Post PNC the coin features an artistic extension of the International Day of People with Disability logo on the reverse. Total mintage of the coin is declared at 10,000 coins and these were quickly snapped up with an early sellout at the Mint, their value more than doubling over the issue price of $10 in a matter of days for the coin in the RAM card. This pretty little coin striking a chord with many of the 4.3 million Australian’s living with some form or disability, the release empowering their voice for inclusion and empowerment in this fast paced world. This International Day is observed by the United Nations to promote awareness, the commemorative coin doing just that. The packaging features Paralympian Mr Dylan Alcott OAM patron of the 2017 International Day of People with Disability. The coin is issued in the two packaging types seen below, the coin in the blue card from the Royal Australian Mint and in an Australia Post PNC (postal numismatic cover). The RAM packaging is believed to be limited to 3,000 and the PNC 7,000 giving the total 10,000 coins released. The blue cards were issued at $10 and the PNC $17.95.